Layer Mix Modes give great creative options for digital image editing. Selecting a Mix Mode will change how a layer will interact with the layer below. There are many standard mix modes available and some that are only available in TwistedBrush Pro Studio. Each layer can have only one mix mode selected. 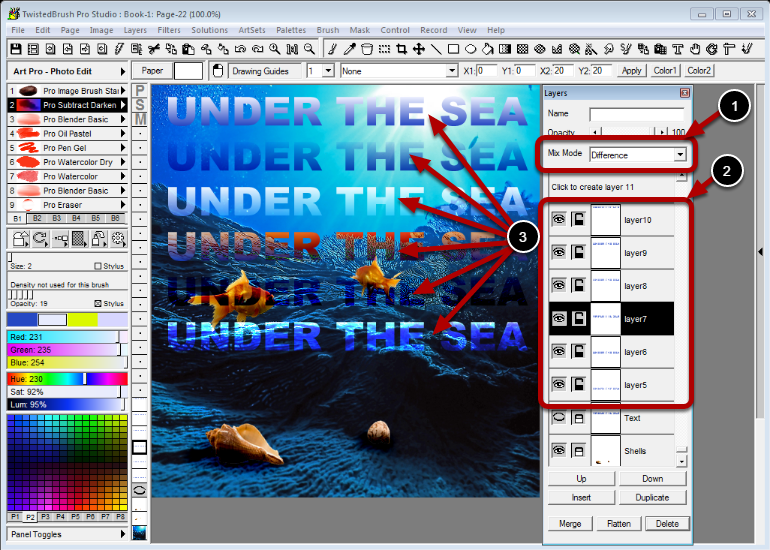 The text "UNDER THE SEA" has been duplicated and a different mix mode applied to each for example purposes. Note: The Grid Snap drawing guide was used to make it easy to line up the text on the different layers when the Move tool was used.